There are some fenugreek side effects that can be irritating and even harmful, but thankfully, they are mostly mild. When fenugreek tea is introduced to the body for the first time, the digestive system can go through a major change. If you have bowel movements on a regular basis, you may have slightly loose stools or even have diarrhea for a period of time until your body acclimates itself. For other people, the taste of fenugreek extract is so strong that it can leave a bad aftertaste that lingers for days. Because fenugreek herb can have a strong effect on the uterus, leading to contractions, pregnant women should never consume it. 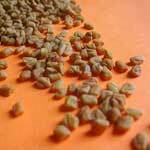 In addition, because fenugreek side effects have not been studied extensively in children, all adolescents under the age of 18 are to avoid this herb. Fenugreek herbal treatments have been largely successful in regulating the blood sugar levels of diabetics. However, this can be problematic if you are already using insulin or another diabetic drug to stabilize your condition. In short, utilizing fenugreek in conjunction with insulin might actually cause your blood glucose levels to drop to an unsafe level. Fenugreek side effects can occur whether you take the recommended dosage or not. Some people’s bodies will react differently to this herbal treatment simply because of their internal chemistry. In addition, older users, persons with weakened immune systems and those with underlying medical issues will likely be most at risk of having a complication. Try taking the mildest form in the mildest dosage first before going to the extract or the pill. To do this, you will only want to let your tea steep for a few minutes before removing the teabag. Fenugreek side effects aren’t something that the average person should spend much time worrying about. If you are over 18, not a diabetic and not currently pregnant, you can drink it as a tea, take the supplement or even add the extract to your foods safely. The best news concerning this herb is that there are many fenugreek health benefits that make these potential complications much more bearable.